Born and raised in St. Louis, Missouri, Tricia Wilbur graduated from the University of Notre Dame with a Bachelor of Science in Civil Engineering with a concentration in Environmental Engineering. 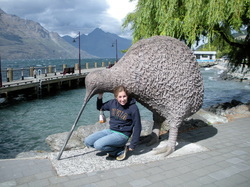 During her first semester of her junior year, Tricia studied abroad in Perth at the University of Western Australia. At this point, Tricia fell in love with traveling and learning about different cultures. She spent this past summer backpacking in Central America, where she enjoyed practicing Spanish and developing a deeper appreciation for Latin culture and humanitarian work. At USF, she enjoys playing a variety of intramural sports and exploring Tampa with the other MI students. In the past she has worked as a camp counselor for Notre Dame’s Introduction to Engineering Program, a lab assistant in an Environmental Engineering lab at Notre Dame, and as a technical intern at an engineering firm in Orlando. But, her research interests include applying anthropological research in the field of engineering, especially in developing countries. In the end, she hopes to work towards culturally appropriate solutions to public health problems involving drinking water and sanitation.